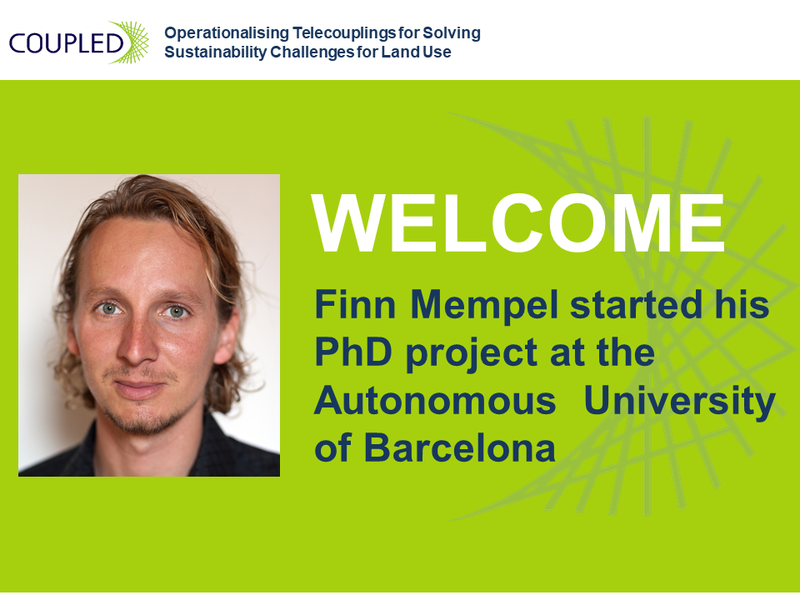 We are very happy to introduce our PhD fellow Finn! Finn Mempel (ESR 08), supervised by Beatriz Rodríguez-Labajos, will be working on the research project Justices and Injustices in the Soy Value Chain, based at Universitat Autònoma de Barcelona (UAB). Finn is from Germany, where he completed his undergraduate studies in Environmental and Resource Management, after doing his thesis work on collectively managed water supply systems in Colombia. Finn was then part of an international Master’s Program in Ecohydrology, which took him to Portugal and Brazil and during which he specialized in developing remote sensing applications for aquatic environments. He has worked in a climate research institute and a service-provider for geospatial analysis in the past and has further started to work as a freelance journalist. His interest lies mainly in the field of political ecology. In COUPLED Finn sees the opportunity to use his interdisciplinary background and interests to work on some of the most challenging, urgent and contested issues facing sustainability science today. His research project aims to integrate the telecoupling approach with the growing body of literature on environmental and social justice. Perceptions of justice across different actors will be contextualized and flows and feedbacks will be analyzed in terms of their effects on distribution, recognition and participation. A major challenge will be to reimagine the matters, subjects and arenas of justice claims in the context of global value chains and telecoupled land-systems. Again, a warm welcome to you, Finn! We are looking forward to a successful cooperation in the upcoming years. You can find more information about Finn’s research project here.